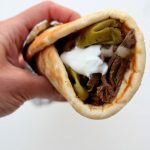 Instant Pot Mississippi Roast Gyros–tender shredded beef that has been cooked in pepperoncini juice is piled into a soft pita and then topped with monterey jack cheese and a dollop of sour cream. We loved the Mississippi Roast that we had last week so much that we decided to reinvent it and serve it in a non-traditional way. I always buy a package of Papa Pitas at Costco. I love how soft this particular brand of pita is. They are so delicious. We also enjoy using these pitas to make individual pizzas on a night when we need a 5 minute dinner. Anyhow, these pitas were staring at me the other day so I decided to try something a little different. I piled in the shredded mississippi roast. Then I grated some monterey jack cheese on top and added a dollop of sour cream. I rolled up the pita and took a huge bite. It was delicious and became an instant hit in our home! 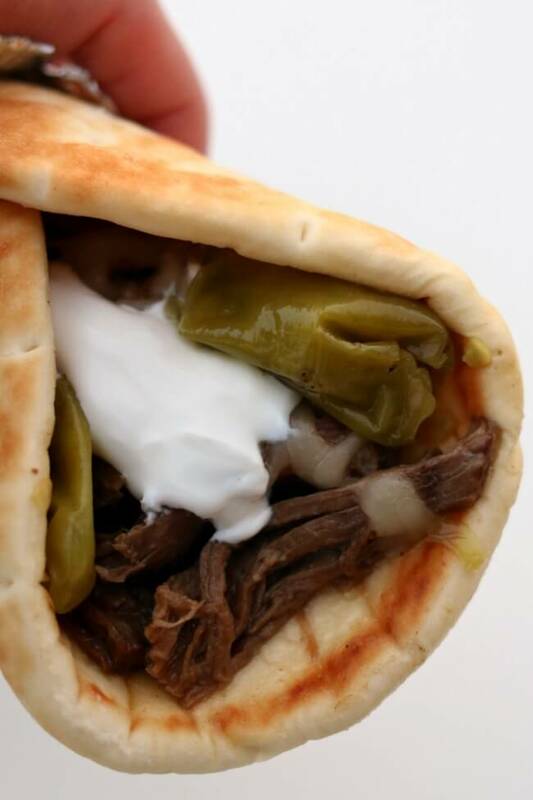 To make Instant Pot Mississippi roast gyros I used my 6 quart Instant Pot Duo 60 7 in 1*. I love this Instant Pot because it has the yogurt making function which I use almost weekly. It has two pressure settings (high and low), and there are also little slots in the handles so that you can rest the lid there instead of putting it down on your counter-top. 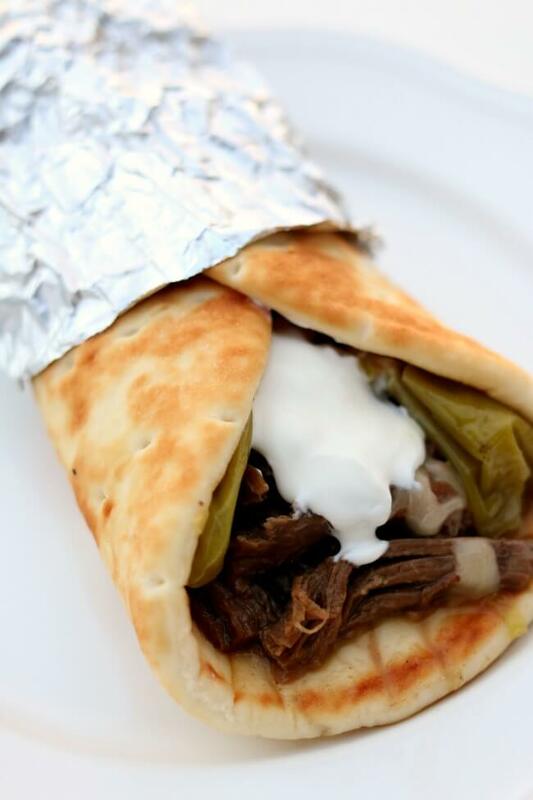 Tender shredded beef that has been cooked in pepperoncini juice is piled into a soft pita and then topped with monterey jack cheese and a dollop of sour cream. Turn your instant pot to the saute function (more setting). Let the pot heat up until it says HOT. While the pot is heating up, cut your roast in half (lengthwise). When the pot is hot add in 2 Tbsp of butter, let it melt. Then add in the roast pieces and let each piece brown for 5 minutes on each side. Do not move the roast while it is browning. After it has browned remove the roast and place it on a plate. Deglaze the pot with the water. Then add in the Better than Bouillon and dissolve it in the water. Add in the pepperoncini juice. Add the roast back into the pot. Nestle the pepperoncinis around the roast. Add in the additional 2 Tbsp of butter. Sprinkle the roast with the salt, onion powder, garlic powder, thyme and black pepper. Cover the Instant Pot and secure the lid in place. Make sure valve is set to “sealing.” Set the manual button (or pressure cook button) to 60 minutes on high pressure. After the 60 minutes is up let the pot sit there for another 15-20 minutes so the pressure can release naturally. If there is still pressure in the pot after 20 minutes move the valve to “venting” to remove remaining pressure. Remove the roast and place on a cutting board. Shred the roast and return to the pot. Stir it in with the juices. 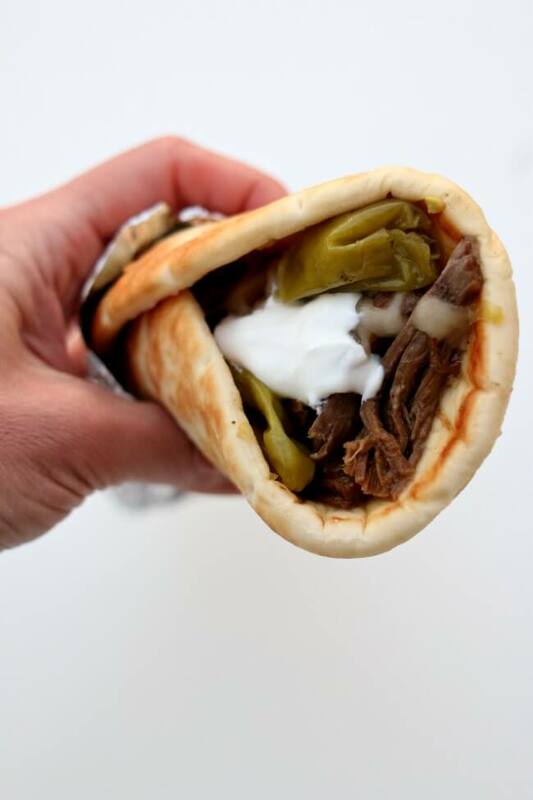 Spoon some of the meat down the middle of a warmed pita. Top with a tablespoon of sour cream and a tablespoon of grated cheese. Roll up and enjoy! Roast–there are lots of types of roasts out there. However, for this recipe I recommend using a chuck roast or a cross rib roast. Luckily these cuts of meat seem to go on sale every month or so. I find mine usually at Kroger for about 2.99-3.99 per pound. Better than Bouillon–I have really come to love and appreciate Better than Bouillon products* lately. I used the beef base in this recipe. I buy mine in a large container at Costco and it stays good in my fridge for a very long time. Pepperoncinis–you can find these small pickled yellow/green peppers next to the pickles. They do add a bit of spice to the dish but it is not overwhelming. My 9-year-old ate the roast with no problems. Could I use diced chuck stew meat for this recipe? Would cooking time be the same? You could do that! I’d cut the time to 50 minutes but still do a natural release. Loved the MS roast- just put shredded beef in juice in refrigerator for tomorrow & can’t wait for dinner tomorrow! Might get some crusty bread and pitas tomorrow. Thank you so much!